It’s Wednesday as I sit down to put together the “Horse’s Mouth” for the Saturday edition of The Rafu. My Tuesday column is written on Sundays. I’m not sure why, but writing on Sundays is always easier than Wednesdays. At any rate, I hope I can fill the space allotted me. This morning I had to go to the hospital for a few checkups, so my schedule was thrown out of whack. When my doctor said I had to check into the hospital, my mind sort of went blank. “I am writing to you with the hopes of helping Nisei Week find old booklets and two of its former queens from over the years. Nisei Week is celebrating its 75th anniversary next year — all of the pre-WWII queens have passed on and all of its post-WWII queens are alive and well. “However, we haven’t been able to get in contact with two of them and they are: Clare Nonoshita Graf and Elisa Cuthbert Nixon. If anyone should know how to get a hold of them, it would very much be appreciated. “We also need help in finding out if there is anyone who might have Nisei Week booklets from the following years as we would like to make digitalized copies of them for posterity. If you know of anyone who might be willing to donate them, please let me know and I’ll make sure that they get to the right people. I’ve been told hat Dulcie Ogi Kawata’s family had some booklets from the 1940s, so you never know what’s in our closets and bookshelves. “We need help in retrieving copies of: 1951 (Aiko Ogomori); 1952 (Em Kato); 1953 (Judy Sugita); 1954 (June Aochi); 1955 (Stella Nakadate); 1956 (Phyllis Ono); 1957 (Mitzi Miya); and 1968 (Clare Nonoshita). Thanks for your letter, Tamlyn. Hope you can find some of the things you mentioned. I know I have a lot of old-time Nisei Week stuff in our garage, but since things have been piling up over the years, I’m afraid to try to look for them. I’ve been hanging around J-Town for so many years, I have collected a lot of stuff, including Nisei Week material. Oh well, maybe I’ll give it a crack. Old friend Patti Kasahara put Tamlyn in touch with me and it’s kind of coincidental that I chatted with old-time queen Em Kato, who was mentioned in Tamlyn’s letter, just the other day and we did talk about the queens from past years. I met Em before she became a Nisei Week queen. She was attending Los Angeles City College at the same time I was, so we used to ride the same “Muni” bus since she lived in the old Bunker Hill area and I lived near J-Town in an old apartment — which means Em and I have been friends for over 60 years. Gee, Em might not want to read about knowing this old horse for so many years. The reader is correct. The Rafu doesn’t publish too many “Letters to the Editor,” although I don’t know if they get any to print. However, as an old-time newsman for another publication, I know we used to get a lot of letters from readers expressing their opinion on what was published in the newspaper. Well, maybe if Editor Gwen reads this piece she’ll give me her views on the issue. Okay, I know. Since I mentioned in opening the column today about having to go to the hospital, no doubt some of you may wonder why. To put it simply, I guess you can blame old age. When you reach my age, my doctors all want to have me checked out, if not at their office then at a local hospital. Hey, it isn’t easy growing old. Heh, heh. Another reader asked where I get a lot of the material I use in my column. “It’s gotta be tough writing two columns a week,” he wrote. Yeah, at times it does get a little tough, but I have connections with several newspapers, including a couple from Hawaii, so I usually get ideas for my column. New items from Hawaii often involve Japanese Americans living in the Islands, so the material is usable in a publication like The Rafu. 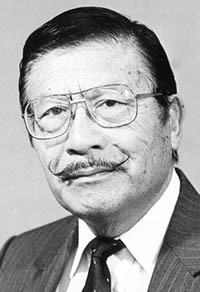 Many of the stories about Japanese Americans in Hawaii involve crimes committed against JAs or about JAs committing crimes. That’s one thing we don’t have too much here in Los Angeles. That is, crimes involving JAs. Speaking of crimes, many of you may have read about a teenage girl having her cell phone stolen from her and when she tried to get it back from the thief, he jumped in a car driven by another person. When the teenager grabbed the thief through the window of the car, the driver sped off with the girl hanging on. When the driver swerved the car in an effort to shake off the teenager, he succeeded and she fell to the pavement and died from head wounds. Kind of a sad story. However, I’m kind of surprised there are not more crimes like this one involving youngsters with cell phones. Today, wherever you look you see youngsters walking along with cell phones stuck to their ears, not paying any attention to what’s going around them. So if someone decided to grab a phone off a young girl, it wouldn’t been too much effort for the crook. Heck, I even tell my wife not to walk around in public chatting on her cell phone. Not only because of criminals looking for victims but also getting hit by a car if she tries to cross the street so engrossed in conversation that she may not pay attention to oncoming traffic. I rarely use my cell phone while I’m walking around. What’s so important that one has to chat on his/her cell phone while not paying any attention to what’s going on around them? I guess the sad part about all this is that nobody seems to be concerned about the use of cell phones wherever they might be. What ever happened to the good old days when one had to put a quarter in the slot at a pay phone booth to place a call? Time for a short laugh. He then walks back to the golf cart, gets another ball, and throws it into the yard as well. I guess when one lives in a city like Los Angeles with its own Japantown, we forget that there are other areas in our state with huge Japanese American populations, and the JAs who reside in these cities hold events much like Little Tokyo’s Nisei Week. In Northern California, in the City of San Jose, there is a J-Town similar to Little Tokyo. In fact, San Jose’s J-Town might even be as large as Little Tokyo because JAs who live in the surrounding area all come to their J-Town for festivities. At a recent gathering in San Jose, the number of people attending easily matched Little Tokyo’s festival. At least that’s the opinion I gathered in reading about the Northern California festival. And while Little Tokyo’s festival drew a lot of non-Japanese visitors, the San Jose one appears to be strictly JAs. From letters to a phone call. I don’t know how he got my phone number since I’m unlisted, but a reader called me the other day to say that after reading about my trip to the Pala Casino a couple of weeks ago, he hopped in his car with his wife and went there. Well, thanks for you letter. I’m glad you enjoyed yourself. I guess that means you might have made some money playing the slot machines. However, as I also write, nothing can take the place of Vegas. Of course, I hope my son doesn’t back off from volunteering to drive my wife and me to Vegas. I realize he has his own schedule, which can change his plans overnight. Oh well, if that happens I guess it’s back to Pala. A few paragraphs short today, but I have a busy schedule tomorrow (Thursday), so I’ll be cutting off my chatter at this point.